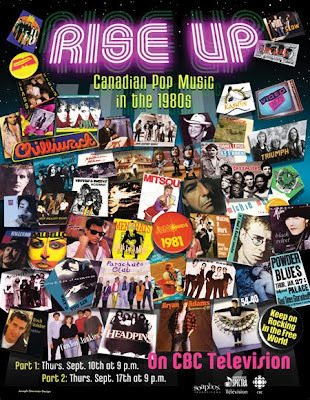 This is a new DVD available called "Rise Up: Canadian Pop Music In The 1980s. This documentary originally aired over two Saturdays in September 2009, on the CBC network. Here is the web link on the CBC web site for more info about the program. Earlier today at my local Wal-Mart Supercentre, I saw the DVD for sale as a new release item. So, if you are a huge Canadian music fan from the 1980s, I suggest you pick this DVD up for your collection. I was a big fan of Canadian music of this decade. Guess the title comes from the song by Parachute Club--what a great band. Wonder how easy it is to get the dvd in the U.S.
You should check out Amazon.com for the DVD. I saw it on Amazon.ca, the Canadian equivalent of Amazon.com. The web site for CBC TV at cbc.ca would be a good place to start. They have an online store where you can buy it.